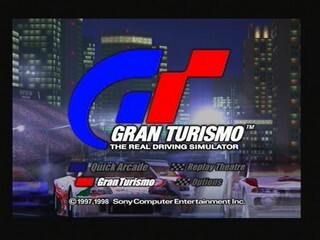 Kickstarting the popular Gran Turismo franchise, the first game took five years to develop but became the most popular game fot the PS1. Immerse yourself in a world with 140 cars, 11 race tracks (and their reversed versions) and plenty of races and challenges as you aim to become the fastest driver in the world. Best European version GT-League time: Single-segment 1:39:51 by 'Meesbaker' on 2015-02-15. Basically this one is just wall sliding. It is important that the car hits the wall late and frontal as this speeds up the car at this game. Many corners will cause a license fail when crashed frontally but these do not. Corner 2 and 3 and the final corner are worth sliding. Crashing corner 2 wall needs some countersteer to avoid spinning. 1:03.3 is easy here. Only one wall slide in the long tunnel, difficult corners, still very easy as the laptime is just not set very close. This is an easy 1:17. We just have to avoid missing the apex too often. This one has no wall slide but breaking early on the close corners in the beginning and cutting over the curbes will save good time. Only the long corner after the downhill part must be taken with countersteer. We steer and brake once we are already in the corner and countersteer to avoid spinning. This is basically a very easy 1:19, I did 1:18 already. If we survived Special Stage this one will kick us out instead. Corner 3 and the one with the arrows after the tunnel are worth sliding, we do not get much more help. It is important on all of the corners after that to avoid hitting the curbes too much. A single flaw here and we are out. Super easy but always scary. Wall sliding is the word here but there are some passages where we can get stuck. Precise steering is the key here. Grand Valley again. Once more the gold time is very friendly so we can only beat ourselves. On corner two we spin the car 180 degree and hit the gras and the wall with the back of the car. It looks dangerous but really is not. It is important NOT to slide in the long tunnel this time but in the short one. Also when sliding the car must be turned a little to avoid disqualification. 1:53 is my best here.